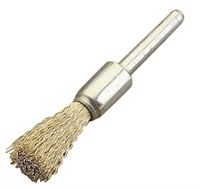 Applications: These end brush wheels are spindle mounted for use on air tools and drill chucks. They are ideal for cleaning cyinders, corners and recesses. The twisted knot version will give greater aggression and has more stiffness where pressure is required. Product Notes: The crimped wire used is brass coated steel which has the benefit of slightly increased flexibility and longer life. The twisted knot design is made of non-coated steel. Spindle dia: 6mm. Sold in packs of 12.